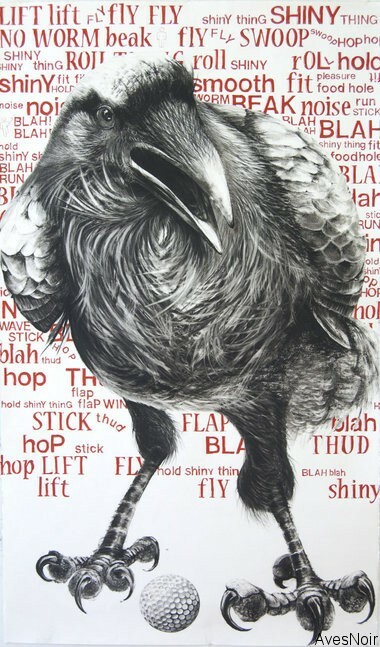 Karen’s current sculpture and drawing work, focused exclusively on crows and ravens, examines the complex, interwoven relationship between humans and corvids.Â Her artwork has been exhibited widely in the United States, as well as in Canada, Italy and England. Bondarchukâ€™s contribution to the art show is a six-foot charcoal-and-ink drawing titled, â€œIn Defense of a Stolen Golfball” which was inspired by a story she heard about ravens stealing balls from a Virginia golf course. You may follow Karen by visiting her website at www.karenbondarchuk.com.